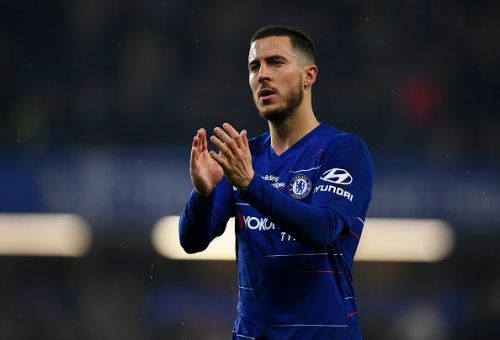 Former Everton midfielder Leon Osman believes Chelsea star Eden Hazard should be in contention for the coveted Ballon d'Or award, stating that it is a surprise that he has not won it so far. France Football's prestigious Ballon d'Or was the centre of a duopoly between Lionel Messi and Cristiano Ronaldo for about a decade but that changed last year when Luka Modric controversially took home the gong. Hazard has had a productive season, netting 16 Premier League goals so far this season. Together with his 12 assists, he is the player with the most contribution to goals in the English top-flight in the present campaign. The 28-year-old, who has been heavily linked with La Liga giants Real Madrid, has 18 months left on his contract and it is believed he could move to the Bernabeu, should the right offer comes. "Oh absolutely [he’s a potential Ballon d’Or winner Hazard]. It’s probably a surprise that he hasn’t managed to win it already." "Yeah but even so, he has been absolutely sensational at times. Okay, he’s probably had a few dips, a few lapses in form and maybe the fact he hasn’t led Chelsea to European glory or his country to the Euros or World Cup successes is probably what has held him back. "Certainly Ronaldo’s managed to do that and that’s probably why they end up getting the rewards." "I don’t think he’s replaceable. I think it’s as simple as that. There’s only three or four players in world football that are his standard, consistently. Yes, he may not end up with the Premier League Player of the Season this season but over a number of years he’s showed what a top player he is." After their defeat to Liverpool last night, Chelsea will shift their focus to the Europa League where they will face Slavia Praha in the second leg of their quarter-final fixture on Thursday.